Being an eminent company, we are involved in offering best quality of Chain Pulley Blocks. 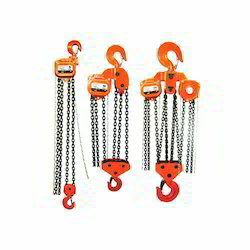 These Chain Pulley Blocks are extensively used by customers. 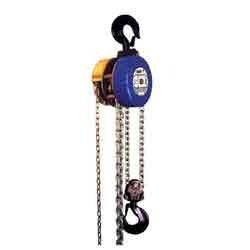 Chain Pulley Blocks are widely used for lifting of loads and for lifting and lowering of Heavy Loads without Fatigue. Further, our products are of world class quality. We trade and supply an extensive range of Chain Block, which is widely used in different industries such as construction, automobile, marine and many others. Having rich industrial knowledge, we are providing Triangular Chain Pulley Block to our esteemed clients. We ensure that the quality of the materials used is in compliance with the international norms thereby meting out the safety standards for the operators. These Triangular Chain Pulley Block are available at leading market prices. We manufacture a wide range of Chain Pulley Block, which is assured of quality and interchangeability of parts. To ensure to deliver assured safety levels, we have tested our range for 50% over load. In the rigid design of our machine, double ball bearing is provided to support the load wheel for smooth operation.